British designer Tom Dixon has completed the interior of members' club and event space Paramount, at the top of Centre Point tower in London. The members' viewing gallery on floor 33 (top image) consists of a champagne and cocktail bar with floor-to-ceiling windows overlooking the city. The 32nd floor has a bar, lounge and restaurant for members and their guests (above), while level 31 hosts private functions and includes a 10 metre-long zinc bar (below). Dixon oversaw the project as creative director of Design Research Studio. Paramount members bar and club, occupying the top three floors of Centre Point in the heart of London’s West End has officially opened its doors. The full members’ club, lounge, bar, restaurant and private-hire events space, designed to offer patrons exceptional facilities, service and produce in an unquestionably spectacular setting is conceived and overseen by Pierre Condou who honed several years of experience at Bistrot Bruno, L’Odeon restaurant and Century Club on Shaftsbury Avenue. Bringing together a wide variety of individuals to eat, drink, relax and exchange ideas, Paramount aims to bring together a wide range of London’s leading influential communities. “I have always loved this central high-rise landmark building. It is in all Londoners DNA. I am thrilled to create Paramount at the summit”, says Condou. Richard Seifert’s Centre Point, completed in 1966, affords Paramount unparalleled views of London, taking in the glistening towers and lights of The City and Canary Wharf in the East, the magnificent unwinding of the River Thames and Westminster in the South, The BT Tower, Oxford Street and Hyde Park in the West and Primrose Hill and the dramatic arch of the new Wembley Stadium in the North. Few, if any, other buildings in the Capital offer such a centrally-located, 360 degree perspective. Magnificent though the views undoubtedly are, there is much more to this building and from the Paramount project. Mark Way, in Association with Murphy Philipps, was appointed as lead architectural consultant in 2006 to project manage the build from inception to creation. Mark has realised the vision working in close collaboration with British design luminary Tom Dixon through Design Reaserch Studio, responded to the brief with a sophisticated interpretation of a raw and stripped-down aesthetic he has developed over recent years. “What a dream job...a building so iconic and so mysterious that has been argued and discussed and reviled and now celebrated and we get an opportunity to design a space that all Londoners know, but almost none have visited,” says Dixon. Here, materials are celebrated as the essential building blocks that they are, unfettered by any excessive ornamentation or fuss that may hide the honest beauty of the end result or that may give rise to a fashion statement that will, by its very nature, be quickly surpassed. Instead, Tom offers a striking, bold and robust design that not only slots seamlessly into Richard Seifert’s architecture, but also offers Paramount a genuine longevity and timeless style. Dixon worked together with leading UK-based lighting design practice GIA Equation on Paramount’s lighting design. Dixon commented, “We have approached it with two principles in mind, first, the view is Paramount...keeping the lighting levels low and moody. Then we wanted to create something that feels that it has always been part of the building without being nostalgic. A tough, self imposed brief, but luckily the cycle fashion is on our side with brutalism and the radical system architecture of the late sixties being re-assesed”. The club interior, designed by Design Research Studio with Tom as Creative Director features furniture alongside vintage pieces chosen by Tom and Pierre that reflect the modernism of the building. Paramount’s different rooms and facilities include a dedicated entrance on the first floor mezzanine level that is accessed via a separate external staircase. Here, atop original 1960s monochrome terrazzo flooring sits a Barbara Hepworth inspired copper reception desk where guests are welcomed by Paramount staff. From here, express lifts whisk guests attending events up to the 31st floor events space, which is a self-contained 4,550 sq ft space with a 10 meter-long bar facing the west side (and, of course, London sunsets) designed specifically for private events – launches, dinners, screenings, meetings and presentations – able to accommodate 350 people standing or 160 seated. One level up, on the 32nd floor, is the main hub of the members’ club, featuring a bespoke Tom Dixon copper bar, relaxed dining and lounging areas, a more formal restaurant, and a private dining room. 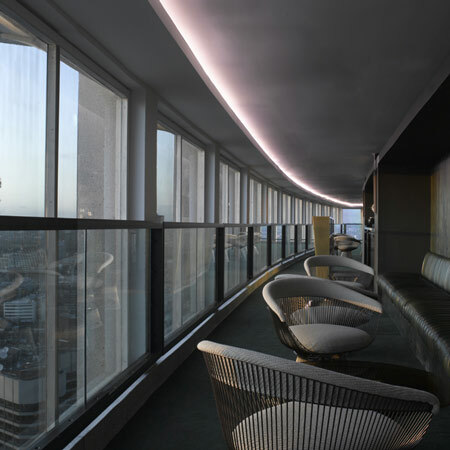 The Viewing Gallery on the 33rd floor is the summit of the building and boasts a members’ Champagne and Cocktail Bar, which curls around the circumference offering floor to ceiling glazing, in a complete 360 degree circle. Located on Level 32 of Centre Point, Paramount members-only restaurant offers a second to none scenic bird’s eye view of London. Headed up by Chef James O’Connor, formerly of Bovey Castle and Damien Hirst’s restaurant in Ifracombe, the menu is an offering of universally appealing classic Modern British dishes. The Paramount private dining room will be open for breakfast, lunch and dinner, while Paramount members lounge will open from 10am until late Monday to Friday and 12 midday until late on weekends, serving a range of cocktails and drinks. As the club offers all-encompassing views of London, so Paramount’s membership is to reach out to a wide cross section of the City’s professional and creative industries. Chaired by Brunswick Group CEO Alan Parker and Stephen Fry, the membership committee includes representatives from cultures as diverse as film, law, media, academia, fashion, publishing, finance and theatre. The committee are currently inviting individuals from these core areas of London life to join what is fast becoming an exclusive, but more importantly progressive and lively new community of Londoners.